Be the first to share your favorite memory, photo or story of Waylon. This memorial page is dedicated for family, friends and future generations to celebrate the life of their loved one. 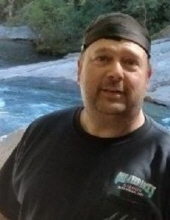 Mr. Waylon Leroy Sears, 49, of Hickory, passed away unexpectedly on Tuesday, January 22, 2019 at his residence. Waylon was born on September 11, 1969 in Toccoa, GA to the late George Sears and Retha Adams Sears. He was currently employed as a diesel mechanic foreman with Kenworth of Hickory. In addition to his parents, he was preceded in death by a nephew James Wong. Survivors include his two children, Brittany and Damion Sears, one grandson, Ethan Sears and three sisters, Wanda Wong, Linda Bryant and Nancy Parker. Also surviving is a niece, Sara Parker, two nephews, Joshua Wong and Jeremy Parker and numerous nieces and nephews. A private service will be held by the family at a later date. Heritage Funeral Services, Valdese, North is in charge of the arrangements. This announcement is courtesy of Acree-Davis Funeral Home. To send flowers or a remembrance gift to the family of Waylon Leroy Sears (Courtesy), please visit our Tribute Store. "Email Address" would like to share the life celebration of Waylon Leroy Sears (Courtesy). Click on the "link" to go to share a favorite memory or leave a condolence message for the family.